NetHex is my first shot at a C# custom control. 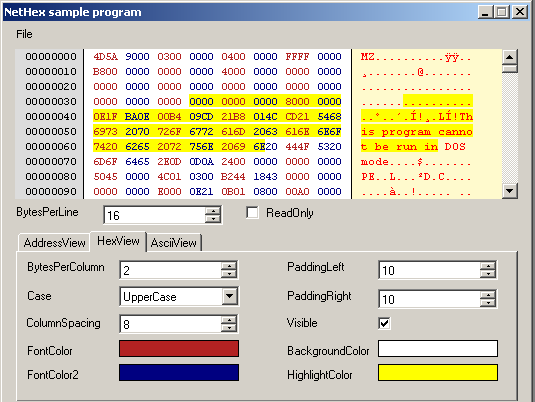 It can be used to display data in hexadecimal representation and to edit that data. It's a C# 2.0 project so you need to have Visual C# 2005 Express Edition Beta 2 installed if you want to test the control yourself. Oh yeah, there's a small bug I'm blaming on Visual Studio. If you modify a form with the control on it and then start the program your VS will terminate without any error message or anything. The work-around is fortunately very simple: Modify the Form, close the Form design window and start the program then. This stops the unexpected termination of VS.